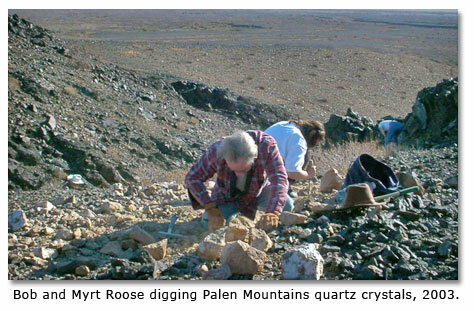 Rockhounds have been obtaining agate, jasper and other varieties of quartz in the Palen Mountains near Blythe, California, for many years. With the passage of the California Desert Protection Act and the creation of the Palen-McCoy Mountains Wilderness Area in 1994, though, most rockhound areas in the Palens were closed to entry by any kind of motorized vehicle, thus greatly limiting rockhounding. Who wants to lug several pounds of rocks and related paraphernalia over a number of miles of steep and rugged desert mountain terrain? For that matter, how many of us can? 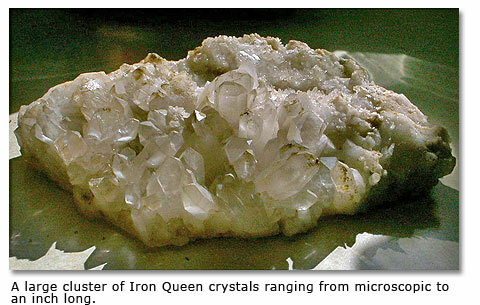 Fortunately, thanks to the existence of the Iron Queen and Iron King mining claims, it still is possible to obtain Palen Mountains quartz crystals and other material without having to hike several miles over exceedingly rough countryside. 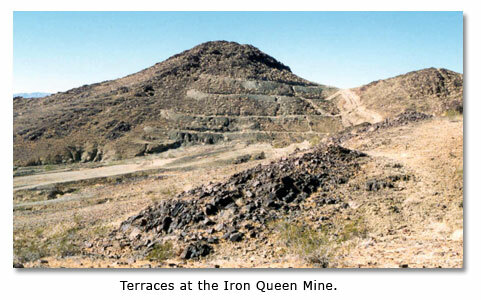 The Iron Queen claim apparently was first located in 1949, with subsequent renewals in 1962 and 1974. While it seems improbable, the adjacent Iron King may not have been located until 1974. The record is not clear. In any case, although some development work was completed, the claims did not produce a great amount of iron ore because the cost of transporting it even the short distance to Kaiser Steel’s concentration plant at Eagle Mountain proved too expensive to allow a profit. The Iron Queen and Iron King claims were not patented, but they were not closed until 1983. By then the boundaries of what was to become the Palen-McCoy Mountains Wilderness Area had been tentatively established. The result is a narrow, so-called “cherry-stem” admittance corridor allowing motor-vehicle access to what otherwise would be a restricted zone deep inside the wilderness area. Although most appear to be found singly, Palen Mountains quartz crystals are sometimes found in clusters. While the base of the cluster may be milky colored, the crystals themselves are likely to be mainly transparent and colorlesswhat sometimes are called “rock crystals.” Varying in size from almost microscopic to larger than a person’s thumb, they can make spectacular specimens. They are highly prized by collectors. You can find them most readily along ridges and in areas where they might have slid down from a ridge, and along veins and other outcrops of white quartz. If they have been exposed to the elements for very long, they probably will appear to be somewhat yellowish in color. Generally, the yellow washes off with a good cleaning. If it does not, and if the color goes all the way through the crystals, you have found something fairly unusual in this areacitrine. Some transparent crystal specimens are double ended. They tend to be clearer than most and, whether clear or containing inclusions, after minimal cleaning, they often make excellent specimens just as they are. They may be in the form of rock crystal, smoky quartz or, occasionally, citrine. Most of the Palen Mountains quartz crystals are found in broken formoften a well-shaped crystal at one end, with the other end broken. They may have broken off from a cluster. While such broken pieces may make good mineral specimens for a collection  at least until something better is found  perhaps they are best used for faceted gemstones. Certainly that is true of the broken pieces that no longer even resemble crystals. 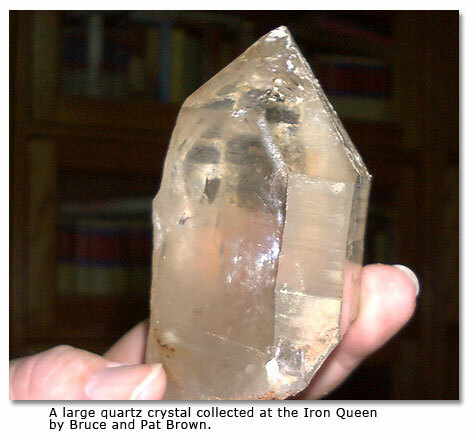 Although it may appear to be anywhere from a dirty white to reddish yellow to black as you remove it from the ground, some of the transparent quartz taken from the Iron Queen and Iron King area produces outstanding, rich smoky quartz and citrine gemstones. While you are searching for quartz crystals, you might want to be on the lookout for some of the yellow-brown jasp-agate that is also found here. It consists mainly of almost ugly appearing yellow-tan jasper, with brown lines and spots, and white lines where cracks have filled with agate. There is nothing ugly about the rich looking polished cabs, slabs, and other forms made from it, though. 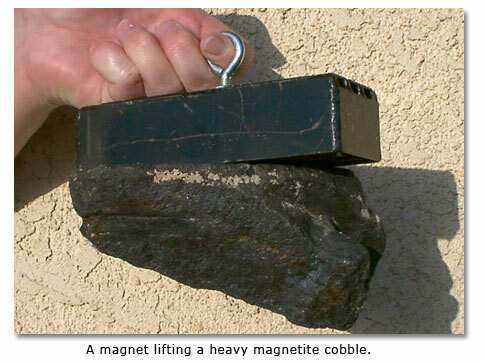 Finally, there is a considerable supply of magnetite, the heavy iron ore that attracted mining developers. Usually dark brown in color, it is not always easily distinguished from other area rocksunless you have a magnet. It is strongly attracted to magnets. To get to the Iron Queen and Iron King collecting area from Blythe, California, drive 21 miles west on Interstate Highway 10 to the Ford Dry Lake exit. Get off the freeway there and drive north approximately 0.2 mile to an information kiosk (that may or may not offer any information) and a pipeline access road that parallels the interstate highway. The pipeline road may have a sign indicating that it is the Palen Dunes Road. At the junction of the freeway overpass and pipeline roads, at about 33°36.632' N and 114°59.359' W, you may wish to set your trip meter or read your odometer because most mileages given hereafter will be from this junction. Turn left, and drive 5.3 miles westward on the pipeline road, past a booster pump at 0.2 mile, the turnoff to Hopkins Well at 0.4 mile  at 33°36.742' N and 114°59.766' W  and a fenced-in area containing valves and other pipeline paraphernalia, until it reaches the interstate at what is known as Dead Man’s Curve. At the end of the pipeline road, bear right and follow the fence along the interstate 1.5 miles, at which point  at 33°38.457' N and 115°05.961' W  turn right and head northward toward the Palen Mountains. In about 0.6 mile, at 33°39.010' N by 115°05.966' W, you will notice some soil heaped into a low mound perhaps 100 yards to the east. That marks what today is called Dead Man’s Mine. Not many years ago two men and a woman were actively mining for gold here. One morning one of the men went down into the mine to work for a brief while, but failed to return when expected. The other man, fearing that something might have happened to his fellow miner, went down to see what might be wrong. He also failed to return. The woman then decided to check. As she peered down the shaft she could see one of the men sprawled at the bottom. She made her way south to the highway where a passing motorist helped her call for assistance. Both miners were found dead. It was later determined that the gasoline powered air pump that they were using for ventilation in their mine was sucking in a small amount of its own exhaust fumes. The men had died of carbon monoxide poisoning, unfortunately not an uncommon mining tragedy. Ever since then, the mine has been called Dead Man’s Mine, and the highway curve, just west of which rescuers cut the fence so as to reach the mine, has been known as Dead Man’s Curve. Back where you turned northward away from the highway, as recently as early 2002, it was still possible to see the repair made where, in their haste to reach the victims, the rescuers cut the fence. Some 8.6 miles from the information kiosk, Palen Dunes Road leads to the west. You will continue driving in a northerly direction, past the first Palen-McCoy Mountains Wilderness Area sign on the right. Continue northward, past a road that intersects at right angles at 33°41.073' N by 115°06.424' W. The intersecting road was built by the U. S. Army during World War II, when this area was part of the enormous Desert Training Center for troops destined for Africa and elsewhere. By turning westward onto it, one can drive to another cherry-stemmed mining claim where quartz crystals may be found, and onward to Palen Pass Road. By turning eastward onto the crossroad, for more than 50 years one could get to the Arlington Mine Road. Today, however, it dead-ends at the southern boundary of the Palen-McCoy Mountains Wilderness Area. Motor vehicles are not allowed in wilderness areas. The final approach to the Iron Queen and adjacent Iron King claims was at one time a fairly broad, smoothly graded, steep road. Over the years since the claims were last worked, though, runoff from the infrequent rains has eroded it in spots. Once you have reached the high point, at 33°42.717' N and 115°06.735' W, just before the road heads downward toward a natural bowl formed by the mountains, you will want to find a place to park your vehicle. You will be approximately 11.9 miles from the information kiosk. On the desert-pavement-covered mound to the south of the road, you should be able to see an outcrop of white quartz. It is a vein that continues under the road, down to the wash, and then up the side of the mountain to the north. Some digging along that vein of quartz should yield nice quartz crystals. Many will be in clusters while others will be singles. Some rockhounds prefer to walk the ridges where little or no digging may be required. Look for the pretty yellow-tan jasp-agate in the same areas. Collectors should be aware that no mechanized digging is allowed. In fact, depending on how the law is interpreted by local Bureau of Land Management officers, even the use of hand tools may be prohibited in the wilderness area itself. Moreover, because of blow sand, you should plan to convoy to the site in two or more high-clearance, four-wheel-drive vehicles to help assure your safety. The crystals you find will most likely be covered with a thin coating of rusty red soil. Water alone, or even soapy water, often will not clean them. Some rockhounds like to soak them in a fairly weak solution of muriatic acid to clean them. Others use different acids or various brands of household cleaning products. Much depends on the collector’s willingness to wait or to use a scrub brush. Once the quartz crystals have been cleaned so that their natural color and clarity can be seen, both clusters and singles make nice displays. Add some polished pieces of Palen jasp-agate  cabbed, slabbed or just tumbled  plus a little rough magnetite, and your display may not only be strikingly beautiful, but also an impressive reminder of your successful rockhound outing to the southern Palen Mountains.